Laser Displacement Sensor; Range: 100-1000 mm. Input: 12-30 V dc; Output: Analog: 4-20 mA. Discrete: NPN/PNP configurable; 2 m (6.5 ft) Cable. Laser Displacement Sensor; Range: 100-1000 mm. Input: 12-30 V dc; Output: Analog: 4-20 mA. Discrete: NPN/PNP configurable; Integral Quick-Disconnect. 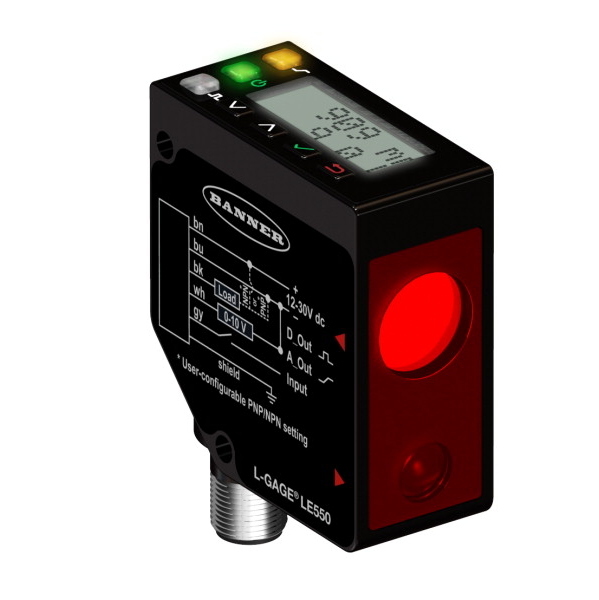 Laser Displacement Sensor; Range: 100-1000 mm. Input: 12-30 V dc; Output: Analog: 4-20 mA. Discrete: NPN/PNP configurable; Quick-Disconnect Pigtail. Laser Displacement Sensor; Range: 100-1000 mm. Input: 12-30 V dc; Output: Analog: 4-20 mA. Discrete: NPN/PNP configurable; 9 m (30 ft) Cable. Laser Displacement Sensor; Range: 100-1000 mm. Input: 12-30 V dc; Output: Analog: 0-10 V. Discrete: NPN/PNP configurable; 2 m (6.5 ft) Cable. Laser Displacement Sensor; Range: 100-1000 mm. Input: 12-30 V dc; Output: Analog: 0-10 V. Discrete: NPN/PNP configurable; Integral Quick-Disconnect. Laser Displacement Sensor; Range: 100-1000 mm. Input: 12-30 V dc; Output: Analog: 0-10 V. Discrete: NPN/PNP configurable; Quick-Disconnect Pigtail. Laser Displacement Sensor; Range: 100-1000 mm. Input: 12-30 V dc; Output: Analog: 0-10 V. Discrete: NPN/PNP configurable; 9 m (30 ft) Cable.